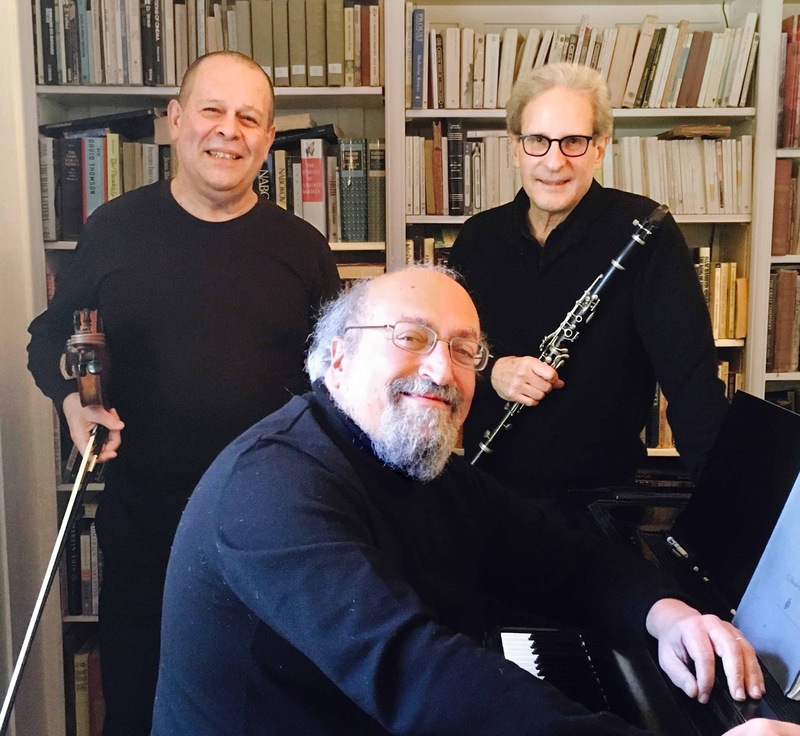 The Troika Trio is composer, arranger and performer Larry London, violinist Victor Romasevich and pianist and composer Arkadi Serper. Iosif Andriasov, 1933-2000, was one of the brightest lights of Soviet music in the generation of composers following Shostakovich. He was internationally recognized during his lifetime as one of the most important figures in contemporary world culture—composer, moral philosopher, teacher, humanist. His compositions include symphonies, concertos, chamber works, and vocal music. His work embodies a form of stylistic synthesis: a combination of pure musical expression and social commentary. The “Concertino” is representative of this aesthetic. Bartok’s “Contrasts” was commissioned by Benny Goodman in 1938. It is based on Hungarian and Romanian melodies and is in three movements: Verbunkos—Recruiting Dance; Piheno—Relaxation; Sebes—Fast Dance. The work was recorded by Goodman, Joseph Szigeti and Bartok in 1940. “Contrasts” is among the most celebrated and successful works of the 20th century for this combination of instruments. Khachaturian was still a student of Myaskovsky at the Moscow Conservatory in the early 1930s when he wrote his Trio for clarinet, violin, and piano. It displays the same rhythmic and harmonic devices that mark his mature works. Along with Bartok and Stravinsky, Khachaturian was one of the first to combine clarinet, violin and piano in a major chamber work. In earlier trios--Mozart, Beethoven, Brahms--the clarinet was combined with viola or cello. But the higher-sounding violin becomes more of a partner to the clarinet, sharing the melodic duties throughout the piece. In three movements, the trio displays Khachaturian's trademark use of crossrhythms, folk songs, extended harmonies. The Trio is one of Khachaturian's most-played chamber compositions. Violinist Victor Romasevich was born in Minsk, Belarus. His mother, Lena Lubotsky, began teaching him piano at the age of four. When five, he started violin studies with Anna Silberstein. At six, he enrolled in the violin class of Mikhail Garlitsky and Lev Sharinov at The Gnesin Music School in Moscow. As a youth he studied violin with Rostislav Dubinsky of the Borodin Quartet. He continued his training at the Moscow Conservatory with Boris Belenky and Nadia Beshkina. Following Romasevich’s emigration to the United States in 1977, he studied at Juilliard with Ivan Galamian. In 1979 he became a violin and viola pupil of the composer and philosopher Iosif Andriasov. Winner of the Gina Bachauer Prize at the 1985 J.S. Bach International Competition, Romasevich joined the San Francisco Symphony as Associate Principal Violist in 1990, and in 1992 moved to the First Violin section. He appears frequently in recitals and chamber concerts as a violinist, violist and keyboard player. Clarinetist Larry London did his undergraduate work at Harvard and earned a Master's degree in composition at Mills College. He studied with Darius Milhaud, Terry Riley and Lou Harrison. He has played clarinet in all of the Bay Area's professional orchestras. He teaches music at Ohlone and Merritt Colleges. His compositions have been performed at the Aspen, Cabrillo, and Telluride Music Festivals, by the Oakland Symphony and the San Francisco Symphony chamber series. Larry London has contributed as a composer, arranger or performer to over fifty films. He composed the music for Isamu Noguchi: Stones and Paper, an American Masters documentary film, recognized as Best Portrait at the Montreal International Festival of Films in 1998. He wrote music for Poumy, A Bridge of Books, and Four Films About Love in 2002 for New Jewish Film Projects. He wrote music for Drawing From Memory: Joann Sfar, a documentary film for French Public Television. Arkadi Serper is a prominent pianist and composer. He had an outstanding career as Musical Director of the Musical Theater Department at the Gnesin Conservatory prior to his move to the Bay Area in 1992. Mr. Serper has performed in Europe, the United States, and Asia. His compositions have been performed by the Stockton Symphony, Vallejo Symphony, Kairos Youth Choir, The Crowden School, and the San Francisco Boys’ Chorus. He has been a member of the Crowden faculty since 1992, coaching chamber music and teaching music theory and composition.